Celebrating the bicentennial of J. S. LeFanu in style, 'The Green Book' Issue four is another wonderful exploration of a weird little corner of literature, and a great example of how careful editing can make even the most obscure subject fascinating and entertaining beyond all expectations. Showers stated goal is right there in the title; and even if you think, well, that's a little specialized for me, you might find yourself very pleasantly surprised. LeFanu is the focus here, in three new articles, and three recollections of past work on the author. One article here collects contemporary reviews of LeFanu's foundational novel 'Uncle Silas'; Showers also offers both M. R James' and Christine Langford's introductions to the novel. Roger Dobson gets down to the details of LeFanu's vampire novel 'Carmilla,' in "The Scarlet and the Black, A curiosity in 'Carmilla.'" Film historian David Skal looks at stage productions of the novel in a wildly entertaining piece, "The Lady Who Munched: How Carmilla Stormed the Stage." Elsewhere in the issue, Albert Power continues his study in genre "Towards An Irish Gothic." One hopes to see these collected in a single volume down the line. And Megan Kuster asks "Who's Afraid of 'The Demon Lover'? 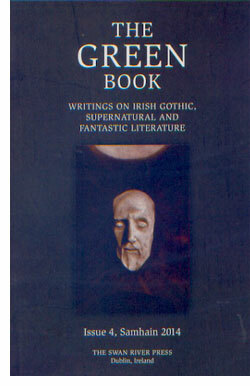 Ireland and the Supernatural in Elizabeth Bowen's Short Fiction." Her answer is engaging and has the desired effect of adding yet another writer to one's ever-growing queue. At least she's pointing to short stories! Showers clearly has an eclectic bent, but he brings to it a focus on enjoyable reading about weird and obscure writing. The audience for this little journal may seem academic, but open The Green Book and you'll find yourself among those academics whether or not you thought it to be possible.